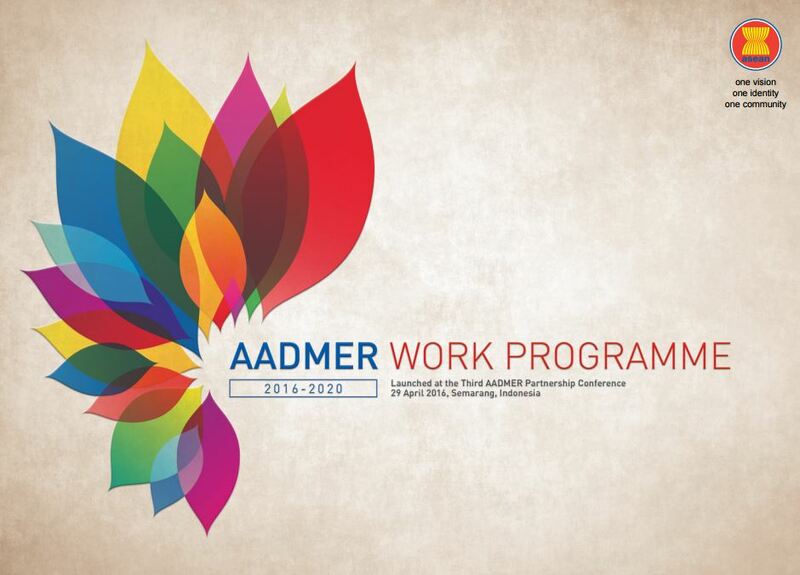 Implementation of the AADMER is one of the cross-cutting strategies of the AADMER Work Programme for 2016-2020. 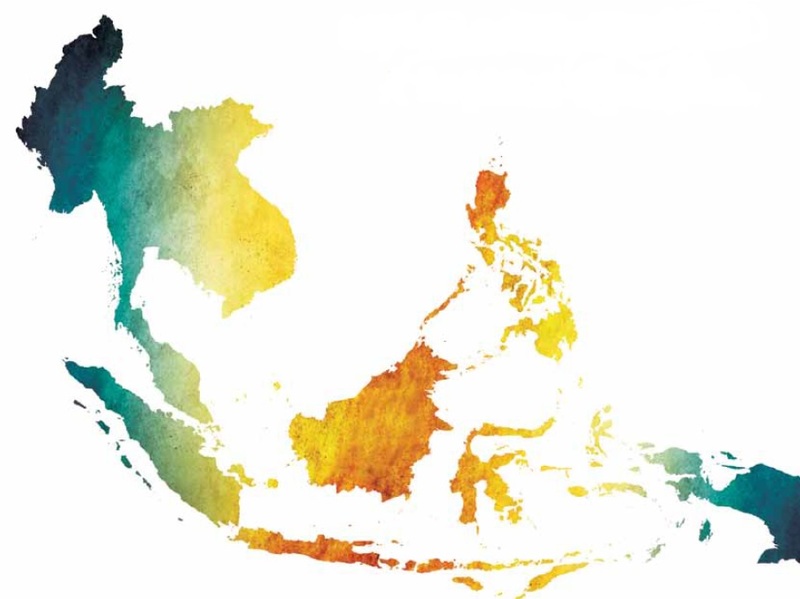 ​The following is a brief regional overview of how that has been realised by ASEAN Member States (ASEAN MS). If the national DRM laws and policies give enough powers to ministries or agencies for the regional coordination roles needed to implement AADMER. The starting point for the ASEAN MS implementation of the AADMER, is that they are committed to having effective national (domestic) systems for disaster risk management. Such systems can be set up in a range of ways. Most involve laws as well as policies. The main legal frameworks in the ASEAN MS, and the institutions they have named as their AADMER focal point agencies, are summarized in the following table. There are different ways to establish national disaster risk management (DRM) systems. Global comparisons indicate that the ASEAN MS as a whole are well advanced in establishing legal and institutional frameworks to meet their disaster risk profiles and forms of government administration. Click here for more information on types of DRM laws. ASEAN Member States do not refer directly to the AADMER in their Disaster Risk Management laws and policies. Most of the laws and policies include general powers to implement the AADMER. None of the ASEAN MS have included specific reference to ASEAN, AADMER, or the AHA Centre in their DRM laws. This includes the 6 that have updated their laws since 2009 when the AADMER came into force. This choice likely reflects the style of legislative drafting for national laws in the ASEAN MS, where treaties are not mentioned by name except in laws made to implement them (if these are required). According to feedback from a regional consultation on 8 September 2017, more specific guidance related to the AADMER is likely to be found in secondary legislation, and administrative procedures. Hence, one of the project’s recommendations was to look at this next level in individual ASEAN Member States that wish to pursue it. Such specific country research was not be included in this first project, as it requires consultations, translation, and verification at the country level. But DRM laws and policies remain an important part of implementing the AADMER. This is because they establish the roles and powers of the relevant government agencies. All of the ASEAN MS have detailed national legal frameworks for domestic disaster preparedness and response. Some of these are set out in one single law, others are set up by regulations and orders, but they are still legal rules. 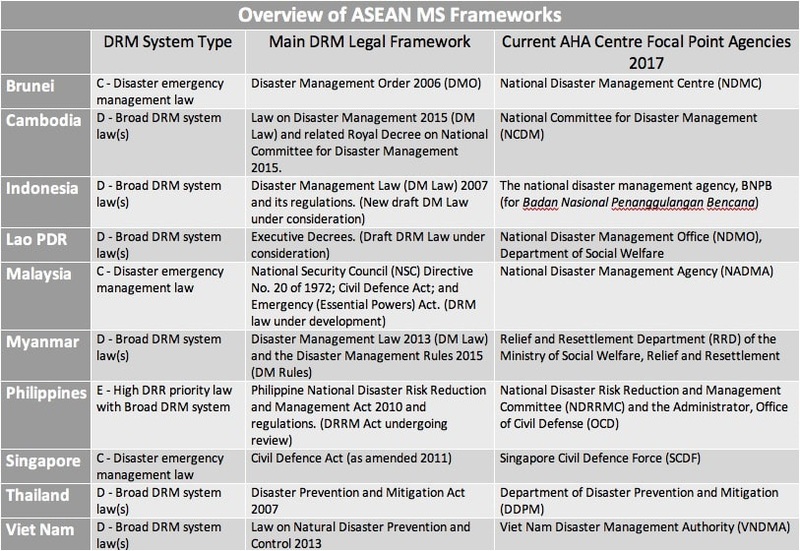 All of the ASEAN MS have set up national disaster management agencies, that have various names. Broadly speaking, these national DRM frameworks do meet the AADMER requirements relating to national disaster preparedness and response. Laws could be further strengthened by empowering relevant agencies to carry out regional coordination functions. In general, the national DRM laws do not give detailed powers to ministries or agencies to carry out all the regional coordination functions that are part of the AADMER. Further research may show this is done through other mechanisms. It is important that the AADMER commitments are implemented in advance of disaster situations, as recognized in the AADMER Work Plan. A number of the DRM laws do include general powers for regional coordination. An example of general powers that can support the AADMER regional cooperation is provided in Myanmar. The DRM law includes national disaster management committee powers for liaison with regional organizations, and also the capacity to provide assistance to other member states. Some of the national laws include general powers for DRM agencies or ministries to engage in mutual humanitarian assistance with other countries and with international agencies. Some of these are more detailed than others. The most detailed examples that relate to interstate cooperation are found in the DRM laws of Cambodia and Myanmar. Another way that DRM laws support receiving international disaster assistance is through tax exemptions for incoming humanitarian goods. Examples of this are found in the DRM laws of Cambodia, Myanmar, and Viet Nam. Allowing humanitarian agencies, goods and equipment to transit across their national territory on the way to support another state experiencing a disaster. ASEAN MS collaborate on other aspects of the AADMER. Collaboration in training, capacity building and other aspects of AADMER implementation. Assigning their national disaster management agencies as National Focal Points for the AHA Centre.